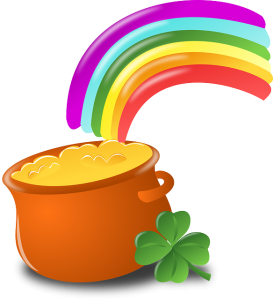 Why is the treasure always hidden at the foot of the rainbow ? Hi ! Sorry for the delay, we have been busy with the event Time2Marketing in Paris. Thanks again to those who came to see us. For those who sadly missed it, the video will be available soon. This week, we will focus on a specific notion, introduced in 2004 by Chris Anderson in the magazine Wired. Here is the original article. And we apply these principal to E-commerce. The subject: The Long Tail Products. Digitalization changes the way we sell and buy a large number of goods, would it be arty, cultural and retail goods, or even services. Entrance barriers are lower, especially when we talk about raw material price – i.e. you don’t have to buy shelves and physically display your stock on them until it sells or expires. At the same time, lowering entrance barriers results in a highly increasing competition, making survival harder. 20th century was about selling products as a hit and run, with little data on who buys what, when or how. 21st century is turning the market into a niche market, where small amount of people regularly buy products that are not mainstream. These are the same products that should actually be considered as turnover makers. Pareto’s 20% of the population accounting for 80% of buying does not apply to the current market anymore, as tools exist to pinpoint the true object of desire instead of best sellers, best sellers, best sellers. An average of 99% of your products that are seen and bought would be stuck in a brick-and-mortar store to the back or a few inches above the ground. 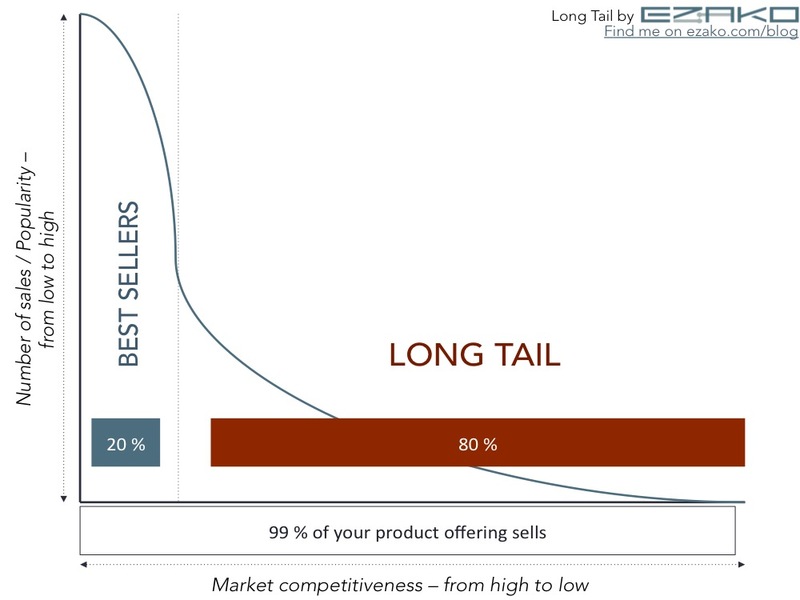 The long tail treasures are the famous 80% of your product offerings that are not best sellers. Overall, when you start considering turnover, margin or any other metric, they can generate way more than 20% of your performance. Why ? Because they represent niche market and answer a specific customer need, that you may be one of the only supplier to fulfill. We will not be original on that one : Amazon is the best example today of long tail and niche optimization. Actually, they may also be the first. Their online marketplace knows how to sell what, where, to whom, with what. In fact, the concept of a long tail was introduced in e-commerce in 2004 with Amazon’s library, Netflix TV show collection and Rhaspody music collection. 2) TV show and music → not everyone comes for the same buffed production or David Guetta’s new hit; the small soap opera and the german 21 years old dj also attracts significant amount of traffic. The long tail effect also exists in SEO and SEM. When talking about SEO, placing your website on less competitive and more precise words will increase your conversion rate. For example, Juice is an extremely competitive word. Orange Juice is a little less. Bio Orange Juice is even less. If your are selling Bio Orange Juice from Argentina and someone looking for it finds you using these exact same words, your chance of conversion is extremely high and the cost of SEM is extremely low. Overall, don’t forget long tail requests in your web marketing strategies, you could end up losing easy customers and revenue. What Amazon does to show the right product to the right visitor is display personalization. In fact, the website shows long tail product in cross-sell or as recommendations. 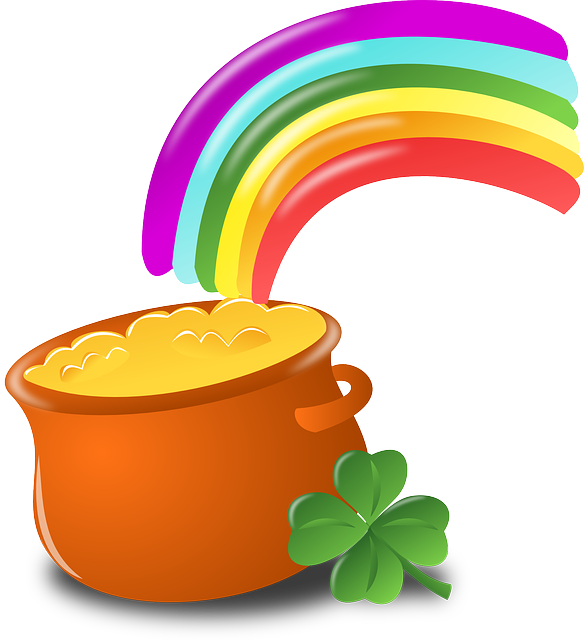 It will analyze which niche market(s) you belong to and make sure you don’t miss a thing. This is called selling the “misses”. Meaning that you actually push and sell the product you would never have highlighted when addressing the mass audience. You would have “missed” an opportunity on your long tail offer. Using E-merchandising techniques and tools can not only help you realize which products constitutes your long tail, but also how, when, and to whom to display them. Just to ensure a certain stable revenue, not relying solely on trends, novelty and bestsellers as your competitors do.